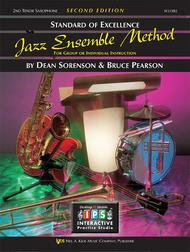 Standard of Excellence Jazz Ensemble Book 1, 2nd Tenor Sax composed by Dean Sorenson, Bruce Pearson. Band. For 2nd tenor saxophone. Band method. Standard of Excellence Jazz Ensemble Method. Book A,1. Method book. Published by Neil A. Kjos Music Company (KJ.W31XB2).ISBN 849757436.Minimum instrumentation for method effectiveness 2-XE, 1-XB, 2-TP, 1-TB, 1-P, 1-B, 1-D The SOE Jazz Ensemble Method is designed for use by mid, JR, HS, community jazz ensembles, and in the private studio. the book is divided into three sections, each representing a different jazz style: rock, swing, and Latin. Each section contains rhythm studies and improvisation studies which may be played with other members of the ensemble or with accompanying CD (affixed to the back cover). Each section of the book also includes jazz chart (13 total) that applies what is learned in the rhythm and improvisation studies. The flexible scoring allows for a full-sounding ensemble with as few as half the standard instrumentation. The director's score include tips on player selection, band setup, audio reinforcement, music selection, rehearsal suggestions etc. The SOE Jazz Ensemble Method will be for both the seasoned jazz band director and the band director with little or no experience at all.About Standard of Excellence Jazz Ensemble MethodThe Standard of Excellence Jazz Ensemble Method is designed to help both you and your jazz ensemble students explore the world of jazz through easy-to-use Rhythm Studies, Improvisation Studies, Instrument Specific Exercises, and full ensemble jazz charts. The approach is non-theoretical and aurally based. Each part book comes with an accompaniment CD, so like every great jazz player throughout history, students learn to play jazz by listening!